I don’t know about you, but I get off track with my writing. I am still in the early stages of earning an income with freelance writing and developing consistent, daily objectives. I have good weeks and I have bad weeks. Because I am a productive person, I can get impatient with myself when I don’t produce. Balance is truly the key to everything in life. We have to learn to take the good with the bad. Keeping a calm, stable attitude helps brings contentment. If we are only happy when we’ve had a productive week or a writing success and discouraged when our week had some unplanned difficulties which kept us from meeting our writing goals, our emotions will be a roller coaster. That may quench and even stagnate creativity. 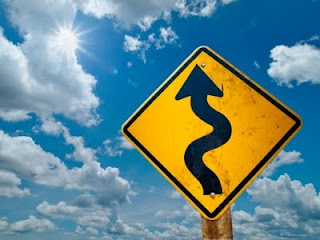 Sometimes the road ahead has a slippery surface, hairpin turns, or detours. Preparation for the unforeseen makes all the difference. I remember learning to ride a bike or ice skate. The worse thing to do was to look down. It was the quickest way to lose your balance. It was much better to look ahead at where you were going. If you fell, you got up and kept going. The same idea works for writing. When the bad days come, remember tomorrow is another day. When you look “down” at yourself, you lose your balance. Accept the fact you can’t always be on top of your game. If you get off track, just get back on the next day. Set aside the lack of productivity or the rejection letter and keep looking up! Great advice no matter what you are working on or trying to achieve. Thanks for sharing and helping us stay on track with our writing goals. Kathleen, perseverance and patience is key to a freelance writing career. You'll have your ups and you'll have your downs. You just have to keep going. Thanks for your comments! (I'm on vacation and just remembered my article was up). Thanks for the great article. I seem to have more bad days than good ones, but I'm working at it! I guess were all in the same boat on this subject. Let's keep rowing shall we? Thanks for the inspiration. A good reminder to go easy on ourselves. I too set big goals for myself and get impatient when I don't achieve them, but in the end, as you well state, balance is everything. Great input, Kathy. Thank you!